"Our troops will fight to win. 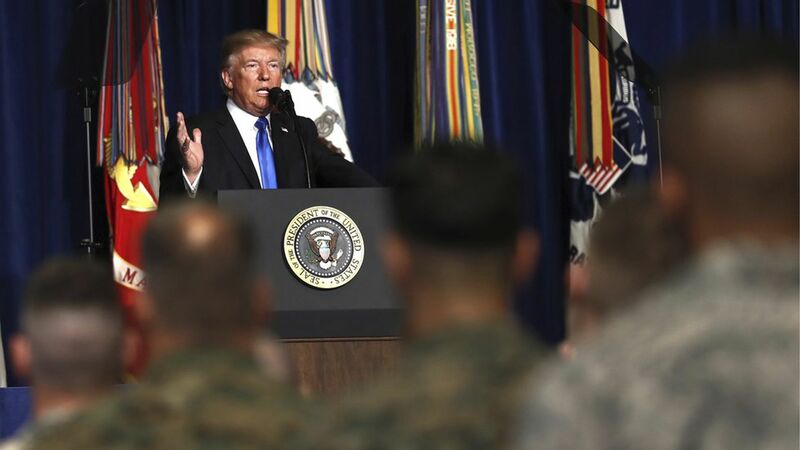 We will fight to win," Trump said during his prime-time announcement on Afghanistan earlier this week, adding that troop levels would be determined by conditions on the ground, not a timetable. Trump's objectives are "obliterating" ISIS and al Qaeda and keeping the Taliban from taking over the country. The top U.S. military commander in Afghanistan, John Nicholson, said the U.S. is increasing our air support to Afghan forces Thursday. But right now, the Taliban controls more territory than at any point since 2001 and boasts several successful military operations just this year. "No serious analyst thinks that the U.S. is going to vanquish the Taliban," Stephen Tankel of CNAS told Axios, and Ben Rhodes, who was Obama's Deputy National Security Advisor, told VICE News this week, "they're not going to leave and go someplace else." Take a hint from those listening to Trump's orders: It's about peace talks. Nicholson, said this week the Taliban can't win on the battlefield and will have to agree to peace talks. Indeed, White House Press Secretary Sarah Sanders said Thursday "the ultimate goal is a peaceful settlement between the government of Afghanistan and the Taliban," but wouldn't detail whether a condition for U.S. withdrawal was getting rid of the terrorist networks in Afghanistan. H.R. McMaster told reporters Friday at the White House press briefing, "No, I'm not confident" a political settlement could hold. Trump himself didn't lay this out in detail. Former Acting CIA Director John McLaughlin told The Cipher Brief Trump's statements "could mean support for a political agreement giving the Taliban a less than dominant share of governing power — but that is not clear." Past talks have tended to be secret but have fallen apart due to "bad timing, bad faith or miscalculation," per the NYT. The Taliban itself has "torpedoed" efforts to talk, Jahvid Ahmad writes for the WSJ. RAND assessed years back that without a third-party guarantor, such as the UN, overseeing negotiations, they could falter and conflict could reignite. One big hurdle is the Taliban is fragmented, and not all factions agree that peace talks are the way to go. Trump talked about putting more pressure on Pakistan for its support of the Taliban, and Secretary of State Rex Tillerson hinted the U.S. could put aid and military assistance on the line to pressure Pakistan to get the Taliban to the negotiating table, Bloomberg reports. Pakistani Prime Minister Shahid Khaqan Abbasi called Trump's announcement an attempt "to scapegoat Pakistan," Al Jazeera reports. China came to Pakistan's defense as well, per the AP. Go deeper on a potential "Trump Doctrine" via the AP's Josh Lederman, here.